The Participatory Communication Research (PCR) section of the International Association for Media and Communication Research (IAMCR) is pleased to report that registeration for its one-day open seminar titled, Imagine Europe is now open. The event will be held on October 19, 2017 at the Byens Hus, Roskilde, Denmark between 9AM-5PM. The Imagine Europe seminar gathers participants, interested in discussing and experimenting with participatory and creative methods, with the aim to articulate, explore, and create knowledge and perspectives on the contemporary, so-called European ‘crisis’. The one-day seminar will include a keynote address, paper presentations, workshops, film screenings and panel discussions to create a critical and reflective dialog amongst the participants that imagines a roadmap to the future of Europe. 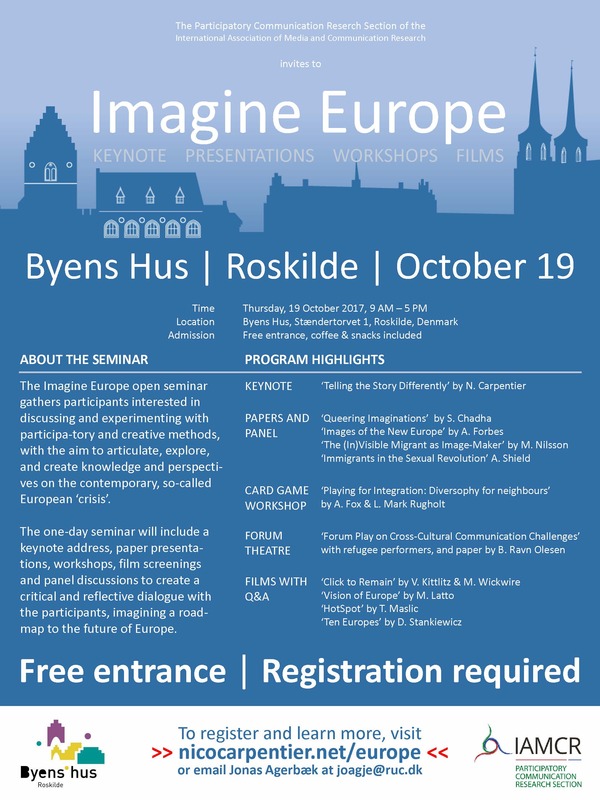 Imagine Europe is an open event the requires pre-registration to attend the presentations and workshops. Fox and Rugholt invite you to play a version of George Simons’ Diversophy cross-cultural card game. The Diversophy cross cultural training game has been used over many years to prepare employees and individuals about to be sent on assignment in different cultures. The game has had global success and its founder, George Simons, in 2015, wondered if it could be adapted to serve a different purpose in the context of the refugee crisis unfolding at the time. This workshop is the outcome of this adaptation made to fit the context of meetings between Danish residents and newly settled refugees. In this workshop, the performing group invites participants to a search for possible ways to handle communication challenges experienced by the group themselves. The workshop is based on Augusto Boals, ‘Theatre of the oppressed’, which is a method to “discuss in praxis”, that is to try different ways of acting in order to find ways to shake or transform the presented communication challenges. In the Theatre of the Oppressed, ‘the audience’ becomes active, as actors, while they explore, show, analyse and transform the reality in which they are living. This workshop includes presentation of Ravn Olesen’s paper, titled, I Have a Suggestion: Forum Play as collaborative and situated knowledge production.